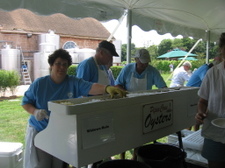 This Saturday, Jamesport Vineyards will host it's annual Oyster Festival to benefit the Southold Project in Aquaculture Training (SPAT) program, a program that teaches East End residents how to grow their own shellfish. Admission is free and the event runs from 1 to 5 p.m. They will be pouring Jamesport Wines and a variety of shellfish from the Peconic Bay will be available for purchase. I don't eat oysters, but make sure that you taste Jamesport's sauvignon blanc. The current release (2007) is a bit more tropical than past year, but it's still one of the best around. For more information call 631-852-8660 or 631-722-5256.